TREND LED is totally made of recyclable materials and allows a long lifespan and maintenance of its performances in the course of time, with signifi cantly reduced maintenance costs. A careful technical and stylistic study of this new fi xtures range and the internal heat conduction distribution system permitting reliability to the overall system and the product long-life. 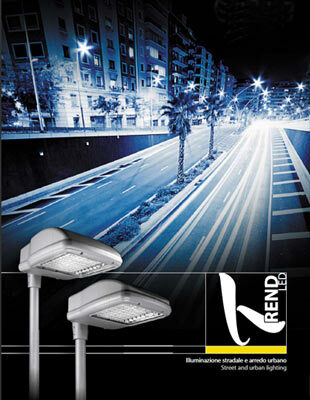 • TREND 4 WAY LED from 30 to 42, with variable led current from 350 mA to 700 mA. • TREND 5 WAY LED from 49 to 56, with variable led current from 530 mA to 700 mA. 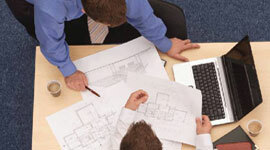 • The color temperature range varies from 4300 to 5000°K (other color temperatures upon request). • Overall protection degree IP 66. • Insulation class (level) I and II. • Body and cover glass case, manufactured in die cast aluminum, with primary alloy and low copper content with high resistance to atmospheric agents, varnished with silver polyester powder coating. • Locking body-cover screws made of stainless steel in built-in hexagonal sockets. • First brand Led (Cree – Philips) mounted on a pressed aluminum circuit, highly heat-dissipating MCPCB (Metal Core Printed Circuit Board). • Complete with power knife switch to interrupt directly power supply when the cover is opened. • Electronic driver led with high effi ciency and durability. • Anti-ageing silicone rubber seals. • Tempered glass (extra – clear). • External stainless steel screws. • Fixture body equipped with an elegant and effi - cient goniometric system, permitting continuous vertical adjustment at constant steps of 5°. • Top or lateral pole mounting, suitable for diameters of 60 or 76 mm. 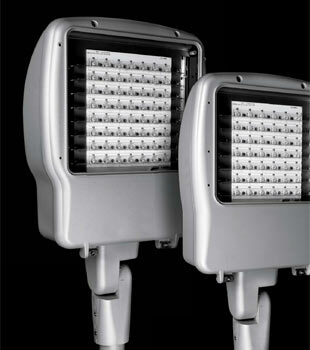 • Floodlight is provided with power cable for outdoor with IP68 external connector for line connection. Thus it is not necessary open the device, as already made in hermetic sealing with overall protection degree of IP66. • All the electric components are ENEC and CE certifi ed, in accordance to the 89/336/CE standard. • The fl oodlight bodies are designed in compliance with relevant European Standards: EN 60598-1, EN 60698-2-3, EN 61347-2-13 and EN 62471. The led source has a light emission towards unique hemisphere. For above reason we have designed special lenses providing a perfect photometric distribution, which together with the finest uniformity allows a significant reduction of glare, solving typical problem of this kind of lights sources. The optical system implemented was designed to satisfy completely the CIE recommendations in accordance with international street lighting regulations. In the final development an energetic analysis has been taken into account, allowing the maximum reduction of the absorbed power, satisfying as well any lighting standards. • The refraction of the light emitted by the led is obtained by means of appropriate lenses for each single led. The material used for the lenses is of first choice with significant optical properties and highly resistant to the optical and thermal decline over time. • The light reflection is obtained with aluminum reflectors (99.99% of purity) highly efficient, allowing to optimize the lighting project and to change the final shape of photometric curve. • It is possible to vary the photometric curve by reducing the number of reflectors optics. There are several optical led for each version. • Further important factor concerns the protection of the lens with extra – clear flat glass, that keeps unchanged the performance of led, lenses and reflectors. Different kind of solutions are reached by constant current converters from 350mA to 700mA. The converter contains a thermal protection that protects itself in any situations of overheating. The converter is mounted on a removable plate in galvanized steel. On request it is possible to obtain a variant with programmable driver, to set the right led current required and reach the requested level of luminance, optimizing consumption. With this system it is also possible to reduce the power during night-time with limited traffic for further energy saving. There is an over-tension wattage and over-current suppression fi lter to protect the electronic components and LED. The fi lter is not provided in versions with led current that have already a resistance to the over-tension wattage, both impulsive and differential mode at least of 6KV.